Brooklyn Revealed offers a photographic tour of Brooklyn, through which visitors will learn about individual neighborhoods as well as the origin of more than 100 Brooklyn street names. 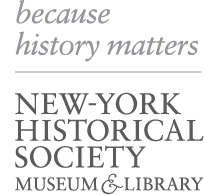 The photographs, all of which come from the collections of the New-York Historical Society's Patricia D. Klingenstein Library, are paired with historical descriptions researched and written by New-York Historical's librarians. In instances where information about a specific street is inconclusive, visitors to the site are invited to submit their own ideas about how the street got its name. Visitors are also encouraged to submit the names of streets not included on the site.